Richmond International Raceway is one of the top stories of the 2018 NASCAR schedule as America’s Premier Short Track will host Monster Energy NASCAR Cup Series and NASCAR XFINITY Series playoff races and bring back spring Saturday racing “under the lights” to the Commonwealth of Virginia. The road to the 2018 Monster Energy NASCAR Cup Series and NASCAR XFINITY Series championships will now lead through Richmond as the track has been added to the select number of tracks (10) who host a Monster Energy Series playoff race. This is a unique opportunity for the Commonwealth to host a pair of major league professional sport’s playoff races at Richmond and Martinsville Speedway. The lights will shine bright once again as the Toyota spring race weekend goes back to Saturday racing at Richmond. With both race weekends “under the lights,” Richmond returns to the tradition it started with its first night race in September 1991 when “Handsome” Harry Gant took home the victory. With brake rotors glowing, sparks flying, and the stars shining bright, it has become the perfect combination for an iconic Richmond race experience. Today’s announcement builds on the momentum of the current 2017 NASCAR season in Richmond, which concludes with the crowning of the regular season champion at the track as part of the Federated Auto Parts 400 Monster Energy NASCAR Cup Series race. The Action Track will now play a vital role in determining the 2018 Monster Energy NASCAR Cup Series and NASCAR XFINITY Series champions with playoff races hitting the ¾ mile D-shaped oval for the first time in the history of the track. The fall Monster Energy Series race will be the second race in the first round of the playoffs on Saturday, September 22, 2018, with the NASCAR XFINITY Series race being the first race of the NXS playoffs on Friday, September 21, 2018. Official start times for 2018 NASCAR races will be announced at a later date. While the momentum is building for next year, there is still chaos to come this autumn as Richmond’s 2017 NASCAR season concludes with two nights of racing “under the lights” on September 8-9. The fall race weekend, presented by Who’s Your Driver, will see history on display as Dale Earnhardt Jr. makes his final career, two-race appearance at Richmond. Witness history in the Federated Auto Parts 400 Monster Energy NASCAR Cup Series race on Saturday, September 9 as the regular season champion will be crowned along with Earnhardt’s final regular season Cup race at Richmond. Saturday night is also the last chance for many drivers to make it to the playoffs. 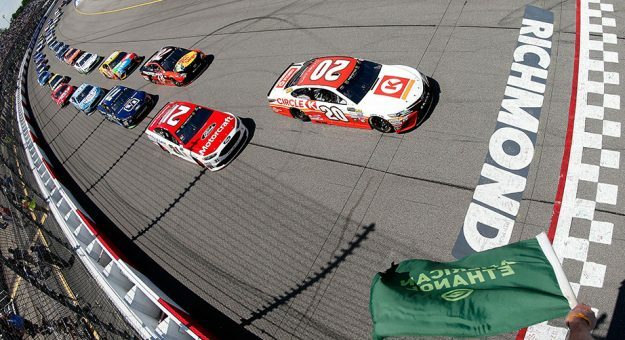 The NASCAR weekend gets started on Friday, September 8, when the rising stars of tomorrow compete along with Earnhardt in the Virginia529 College Savings 250 NASCAR XFINITY Series race following practice and qualifying for both series. Tickets are available now for both the Monster Energy Series and NXS races at Richmond. To purchase tickets, visit rir.com or call 866-455-7223.